NIA-funded researchers have found that happiness is not an isolated phenomenon, unique to an individual, but rather spreads through social networks. Using data from the Framingham Heart Study, Drs. Nicholas Christakis of Harvard Medical School and James Fowler of the University of California, San Diego examined how social ties influence individuals’ mood and sense of well-being. They found that people who are involved in social groups and surrounded by happy people are more likely to be happy themselves. 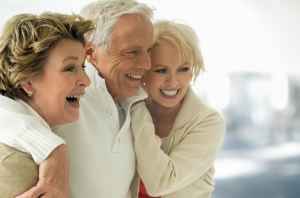 The researchers looked at the happiness of nearly 5,000 individuals in the Framingham cohort during a period of 20 years. They found that one person’s happiness triggers a chain reaction that benefits not only their friends, but those they engage with. The closer a friend lives to a person, the stronger the effect. As distance increases, the effect decreases. This explains why friends who are neighbors or those who see each other often through a social group, have an effect, but those who live far away, often do not. Social organizations also give individuals activities to look forward to and the anticipation of being with others and connecting. This can be a great way to ward of depression and the feeling of being isolated. And, laughter shared with others, can have a most positive effect. People having comfortable social relationships – lots of positive communications with others and social involvement – were 50 percent less likely to be ill compared to those who had infrequently social support. The study shows that social relations have a longevity effect tantamount to quitting smoking. This is further evidence of how important social groups, friendship and happiness are to our health. Laura Kay House, MA, is the founder and owner of Silver Connections, located in the Triangle area of North Carolina. Silver Connections provides numerous socializing opportunities through events and travel, quality members and new connections for age 55+, active and single adults.